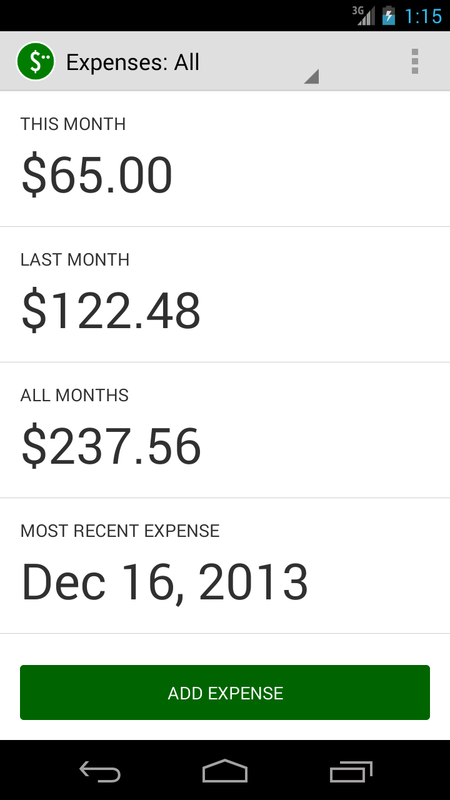 Cash Expenses is a smartphone app for an individual to manage his/her own budget. As a person spends money, he/she types in expenses throughout the day. This app does not connect to any bank account or credit card. I started this project as a replacement to collecting receipts for the month and tallying them once at the end of month. I figured it would be much easier to track expenses daily on a rolling basis, so I wouldn't have to block off a few hours to tally receipts. Cash Expenses saves all data on a smartphone. There is no cloud server to collect a person's receipt data. A person has to explicitly export to CSV, QIF, or email an expense in the menu. A small portion of the app, however, does use Crashlytics cloud service. Crashlytics is a Twitter service for diagnosing app crashes and improving app stability. I continue to use and maintain this app in 2015. Cash Expenses 6.0 will support Android 4+ and include the new Lolipop look and feel.